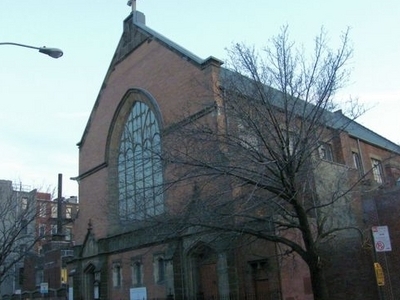 St. Philip's Protestant Episcopal Church is a historic Episcopal church located at 204 West 134th Street, just west of Adam Clayton Powell Jr. Boulevard (Seventh Avenue)) in the Harlem neighborhood of Manhattan, New York City. Its congregation was founded in 1809 by free Africans worshiping at Trinity Church, Wall Street as the Free African Church of St. Philip. It has had an important role in Harlem's history. The first church foundation stone was laid in 1819, and the first rector from 1826 to 1840 was the Rev. Peter Williams, Jr., a leading abolitionist. The "first two sites were on Centre Street. In 1822, a brick building replaced the original wood frame church damaged by fire. This same building would undergo two more reconstructions. In 1834, irate whites vandalized the church and in 1863, New York City police used the church as a barracks for militia and police handling draft riots. By 1886 the church was located on 25th Street." The present twentieth-century church building was designed by architects Vertner Woodson Tandy (1885–1949) and George Washington Foster (1866–1923) of the firm Tandy & Foster. Both were prominent African-American architects: Tandy being the first African-American architect licensed to practice in New York State and Foster being among the first licensed by the State of New Jersey. It was built in 1910-1911 in the Neo-Gothic style. The church was added to the National Register of Historic Places in 2008. Here's the our members favorite photos of "Churches near Harlem". Upload your photo of St. Philip's Episcopal Church!